Today at lunch, I took the Blisstool metal detector, Dragomir, to the park I hunted yesterday at lunch, with the hopes of pulling that elusive Seated coin. Alas, it was not meant to be. This is all the OTC I dug up on my lunch hour. Generally, I don’t post about OTC unless it’s a really cool object. I wonder what the cylindrical object is. It is only one half of it. 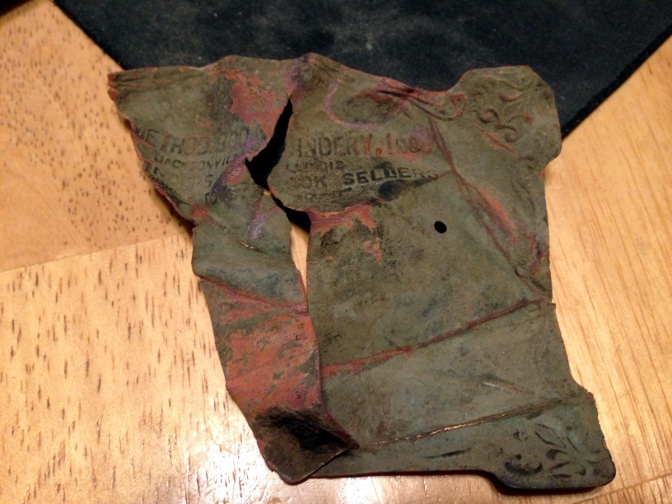 It may have been part of a cigar container. 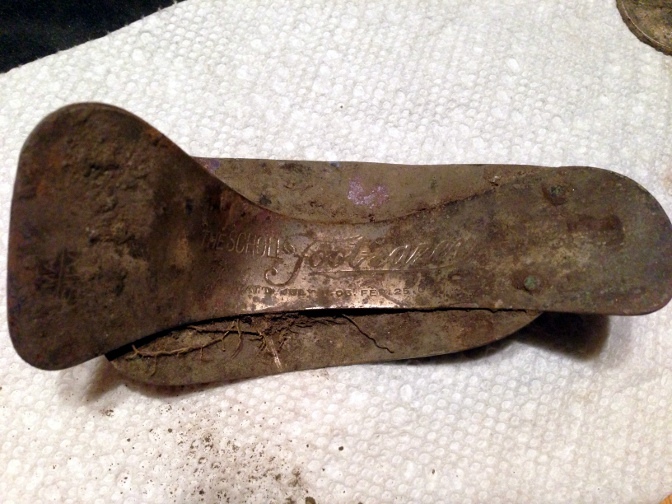 The flat brass object was in the hole with it ***UPDATE…It just occurred to me that this is the end of a pocket knife*** . The bullet case must predate the park, unless it was perfectly OK to shoot your gun at the park in 1884. Bird shot has appeared in my life again. It seems every time I get a new detector and begin to learn its language, I dig a bunch of bird shot. It sounds really good and with the Bliss, I dug those suckers at 5 and 6 inches deep. The square nail and the wire were experimental digs, just to see what the Bliss was telling me. I wonder why they didn’t get caught by the discrimination circuit. Very early on in Wichita, the Chisholm creek ran a very close to where this park is. Just 2 or 3 blocks away, one of Wichita’s earliest mills was built at the edge of the creek. I imagine that people came hunting around the creek as wild life would have concentrated here. I have found a good number of old bullets at this park, including a large .58 caliber mini ball from a Springfield rifle. At any rate, I am getting a little better at listening to the signals Dragomir produces. The Seateds are not far behind. On my second day of hunting with the Compadre, I met a fellow hunter at an old park. 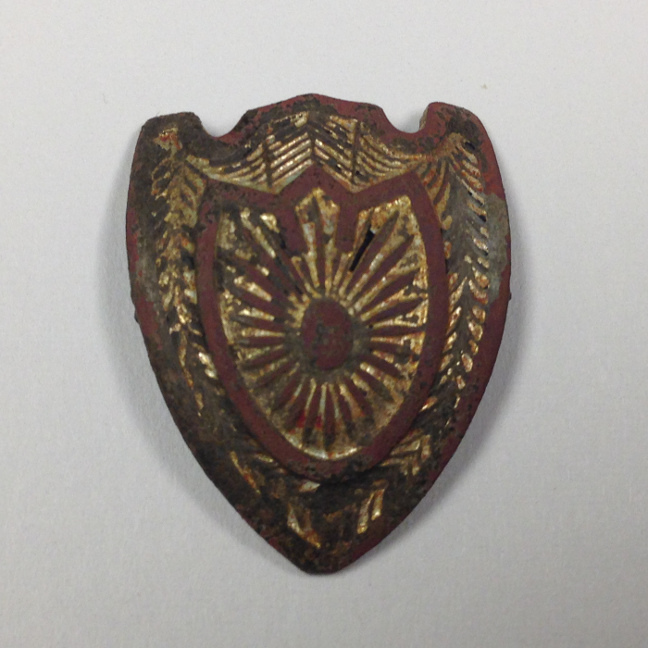 This little shield pin is about one inch tall by 1/2 inch wide. It is (was) gold plated. The back has no writing of any kind but the gold plating is more obvious there. It looks to be old, I would say pre-1940’s. 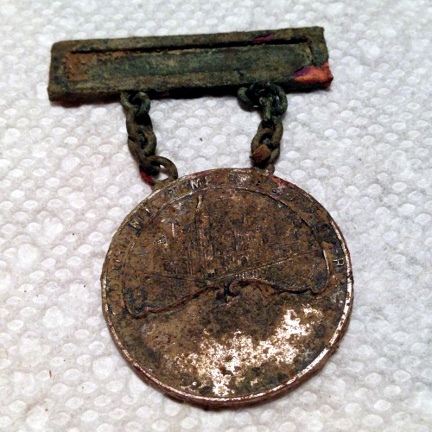 The pin on the back is missing but the welding is plainly visible. Not much to talk about other than I found it with the Mighty Compadre at a spot that I thought Maurice and I had thoroughly cleaned. I must say however that this spot continues to produce targets and probably will continue to produce targets in the future. One last thing; I am using the iPhone ear plugs since the Compadre only has one beep at one volume and fancy headphones are not required. I had forgotten what a royal pain in the behind wires are! I am now in the process of researching some kind of wireless solution for my Compadre. I can’t go back to wires. Don’t ask me. I love finding old foreign money. 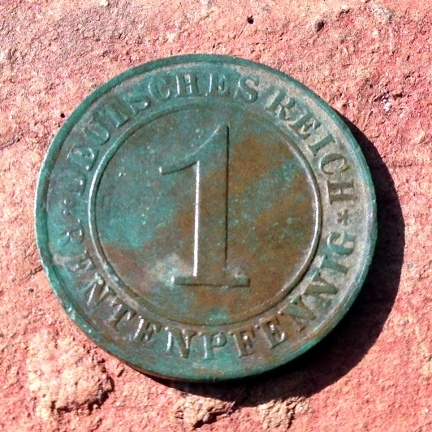 This morning I found this cool Renten Pfennig coin from Germany. It is from 1929 and it’s in very good shape. In size, it is just a tad smaller than a U.S. dime. To date I have found coins from China, Israel, France, Canada, Italy, Mexico, and now, Germany. 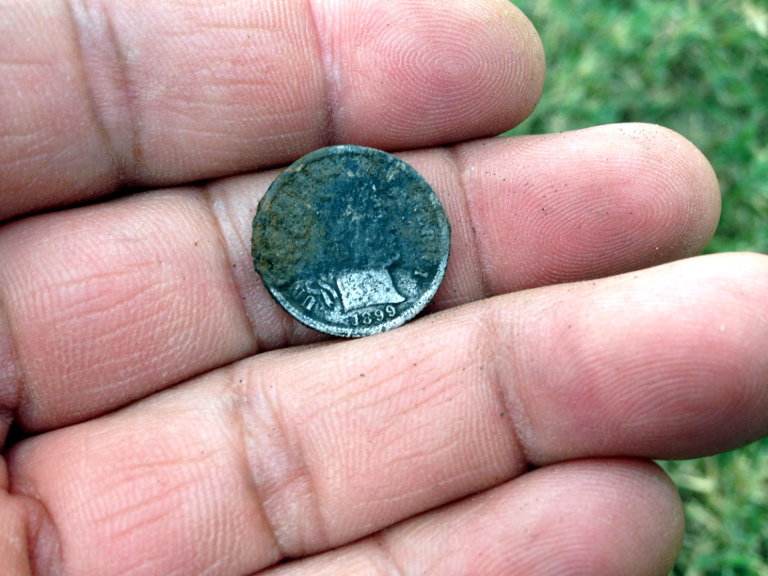 I think it would be extremely cool to find an old silver foreign coin. 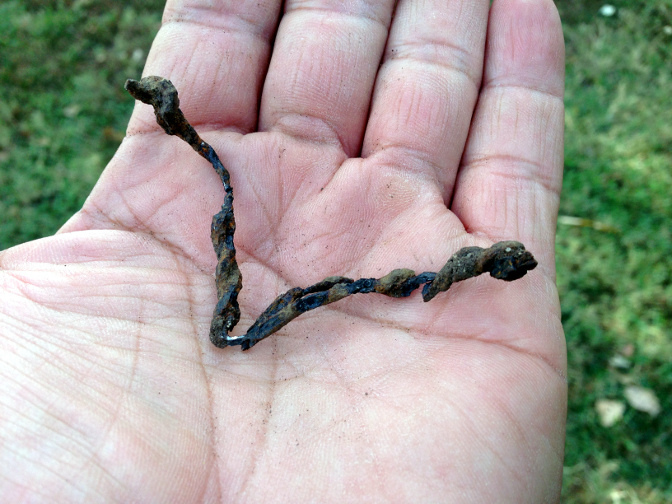 Also, in my hunts, I find many, many pieces of old brass and copper that never make it to the blog. 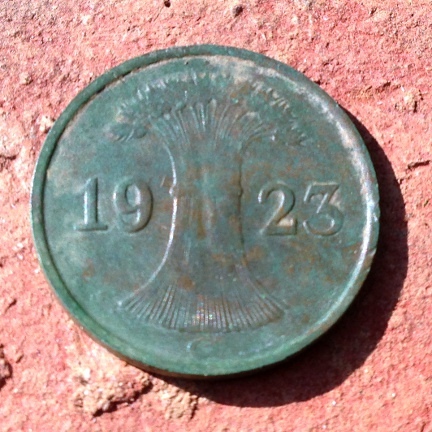 This morning I found this odd piece of brass at the park. It was fairly deep so I surmise that it harkens back to the early days of the park. 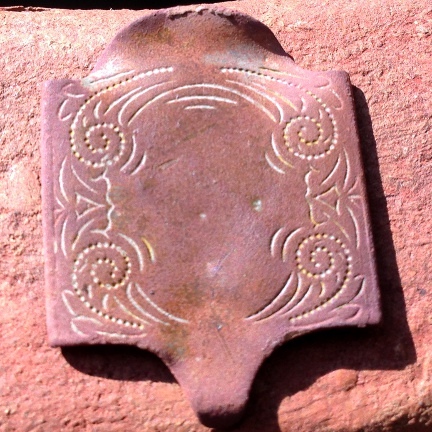 I have no idea what it is but I love how we used to decorate even the smallest pieces of whatever back in the day. 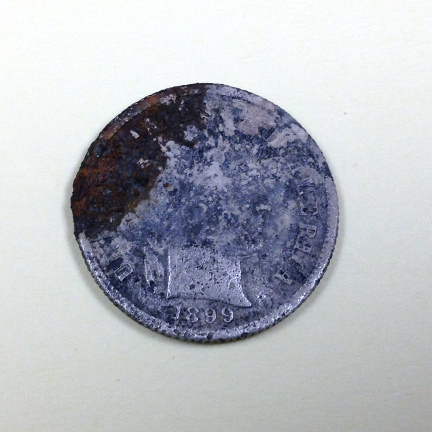 This whatsit is about the size of a U.S. quarter. I stopped at a park on my way home from work last night. The spot I selected to hit with my XP Deus metal detector was a spot I hunted often in the past. 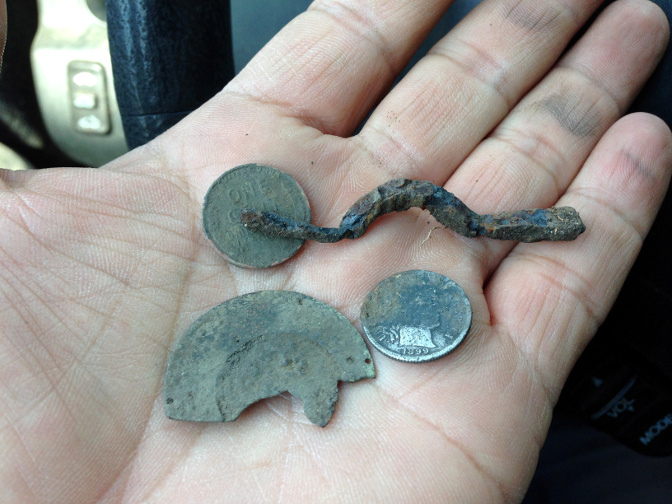 I’ve pulled many a keeper from here including old coins, cool relics, and silver and gold jewelry. I’ve hunted it to the point that the high tones are scant. Knowing that the high tones were all but gone, I decided to do something I’ve threatened to do for a long time and that is I decided to hunt the iron grunts. Yes, you heard me right. I went after the signal practically every other hunter works hard to avoid. Right off I want to tell you that hunting iron grunts is not something you should do often. It will drive you mad. Nonetheless, there I was, digging the old rusted iron. Not pictured here are about 12 pieces of amorphous rusted iron that included many pieces of iron foil. 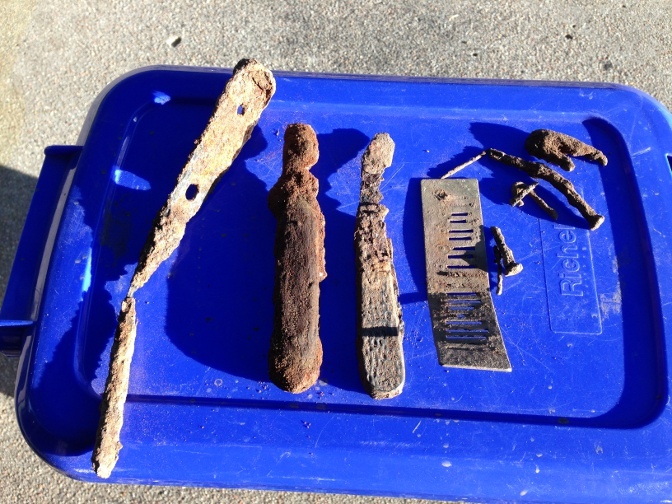 From left to right you are looking at a spatula handle that was about a foot deep, two open pocket knives, a complete harmonica reed and a few nails. I was surprised that I didn’t dig any more nails. 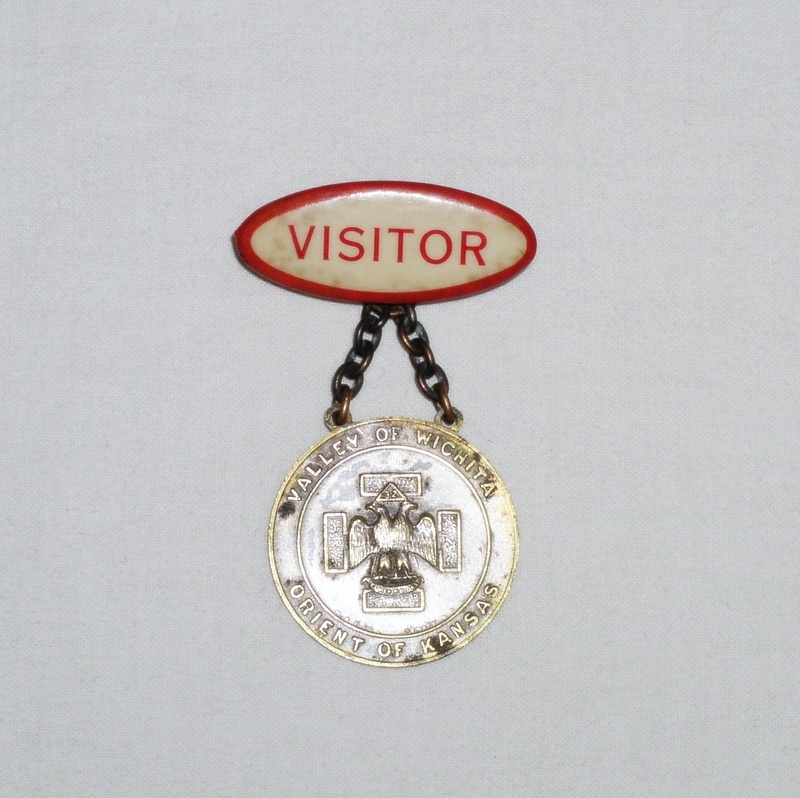 The “pin” is something I’ve dug elsewhere in Wichita and I don’t know what it is. It has a logo but as in the past, I can’t quite make it out. The small button-like round objects are all lead. So there you have it. 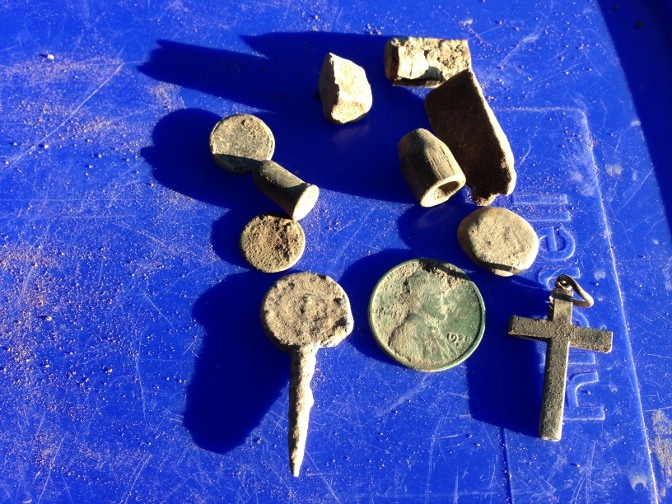 Even though it is not something I recommend you do often, I do recommend you do it at least once but only at a very old site so that at least you can end up with some interesting junk. 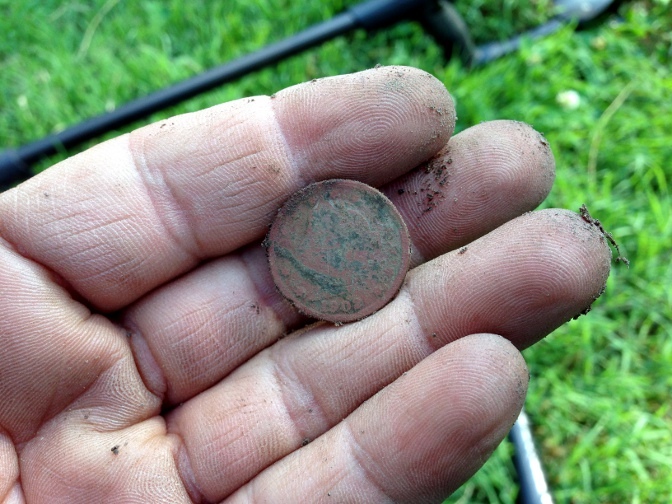 I met Stevouke from the Wheat State Treasure Hunter group after lunch work to hunt a lot located in an old part of town. We both experienced heavy EMI so it was tough hunting. 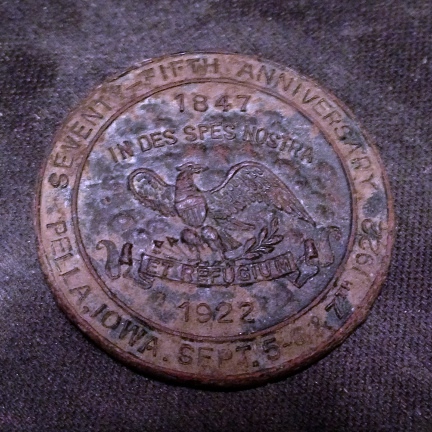 This is a 1922 commemorative token from Pella Iowa. I saw that one sold online for $18. They are supposed to be rare. 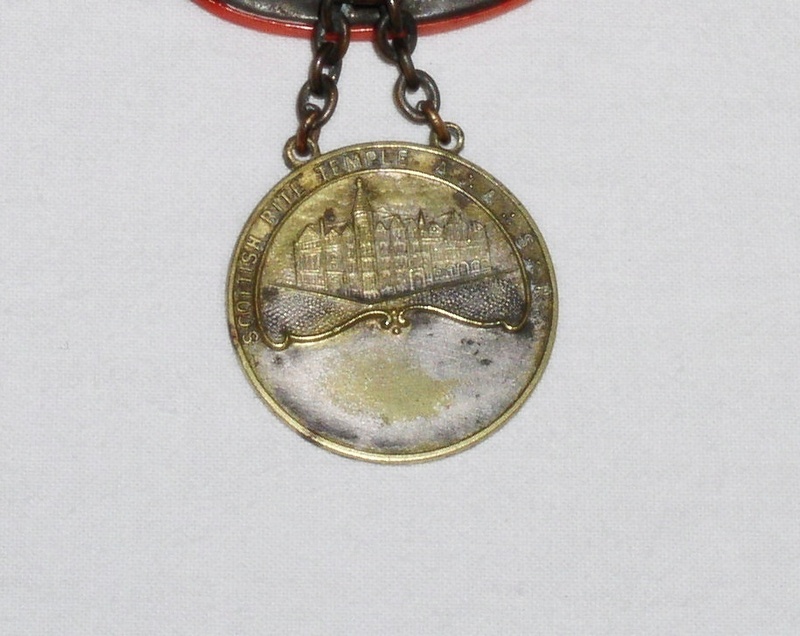 The interesting thing about this token is the Latin inscription; ‘In Des Spes Nostra et Refugium’ translates to ‘In God our Hope and refuge’. Every where I looked however, the Latin for that phrase was ‘In Deo Est Spes Nostra et Refugium’. I wonder if they really misspelled the Latin word for God. Please if you know Latin, weigh in. The last relic is definitely local. I couldn’t find any information about it online. 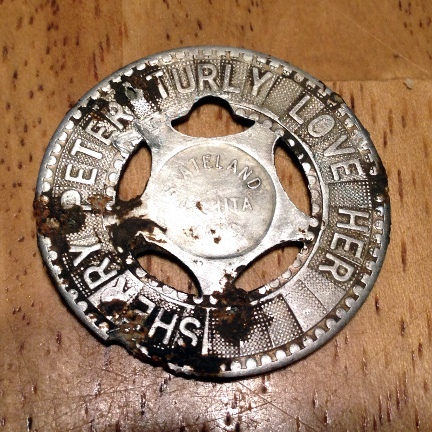 I have no idea who Sherry Peter Turley was. Most of the Turleys that came up on my search were from Hutchinson, Ks. Skateland of course, is a skating rink. I don’t know if they are still open in Wichita. Besides these cool relics, I found a Bell jar lid with the glass insert still intact plus some clad. No old coins.